You may have already decided what color you wish in your retro or vintage style 1940s shoes and whether you need them for general wear, dress wear or sports. But as shoes of any genre differ in so many ways, you may wish to discover the key styles before you go shopping for that all important 1940’s fashion item ! Shop for Vintage Style Shoes at Royal Vintage Shoes for a gratifyingly large selection of vintage inspired shoes including flats, heels, pumps, wedges and sandals. Most women think of the classic Mary Jane style shoe, but there’s a wealth of interesting names that no vintage fashionista should go without knowing! 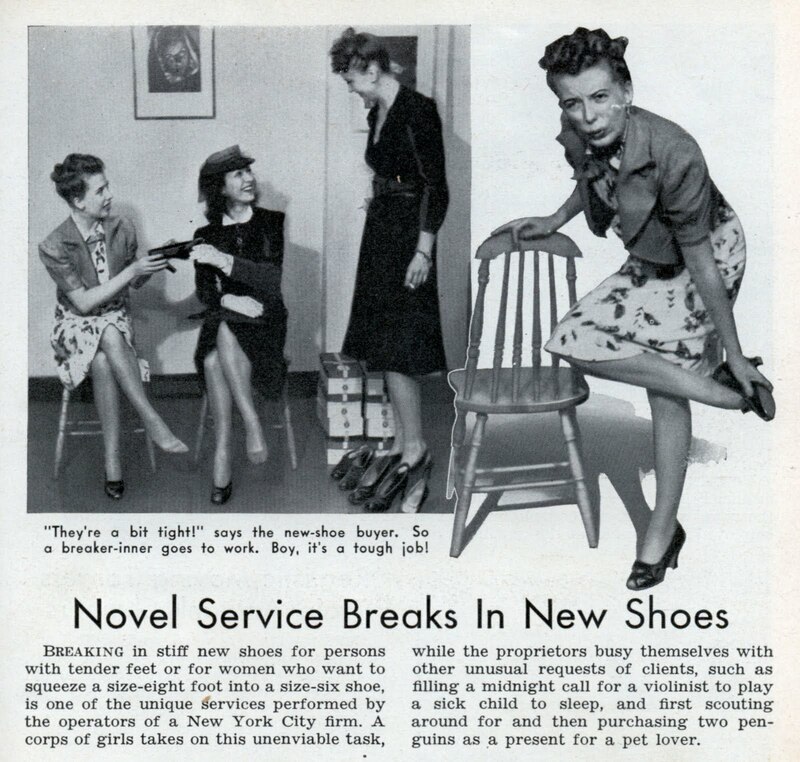 Women’s shoes in the 1930’s and 1940’s were classified as oxfords, pumps, sandals, and boots ( high shoes). 1940’s Oxfords were sturdy and desirable for general-purpose wear because they gave support to the arches and ankles. Military oxfords were especially popular and serviceable. 1940’s Pumps appeared lighter in weight and provided less support than oxfords: many were suitable for wear on dress occasions and for shorter periods of time. 1940’s Sandals could appear light or heavy and be worn for sports or evening, depending upon the styling and the materials. Continental heels (thin cuban); high Cuban or French. Some heels were made of leather and others of wood, but covered in leather ( more common in the more meagre dress code days of the second world war ). A flat heel was very common, being the most practical, for home, school, or work. 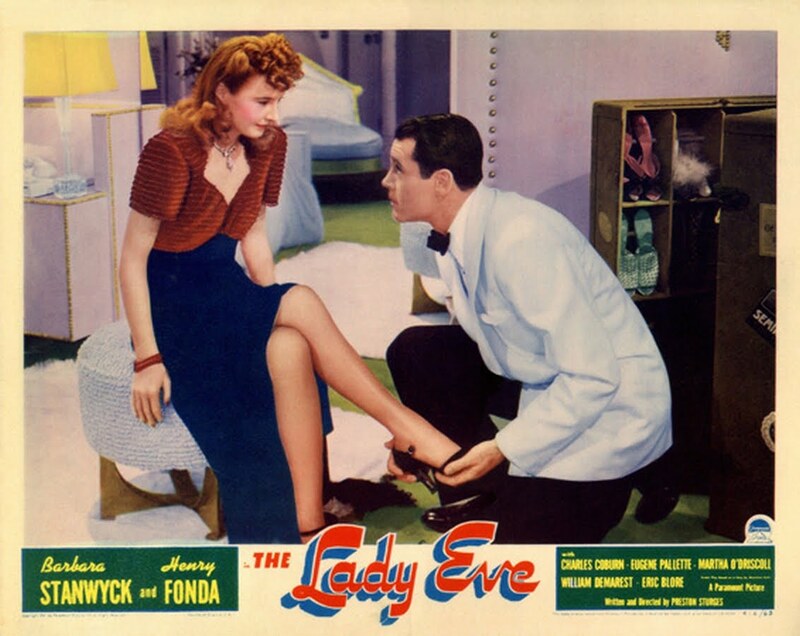 The toes of womens shoes in 1940’s fashion were round or square, boxed or soft, open or closed. The type of shoe you wore made a big difference in how tall you looked or atleast how long your legs appeared. Shoes with broad instep straps made legs look shorter; low cut oxfords and pumps without ankle straps made legs look longer ! Visit Royal Vintage Shoes for instantly wearable vintage style shoes for women. The most authentic 1940s era shoes we can find on the web today. Just to finish off, I’ll bet you never heard of a Fluoroscope ! 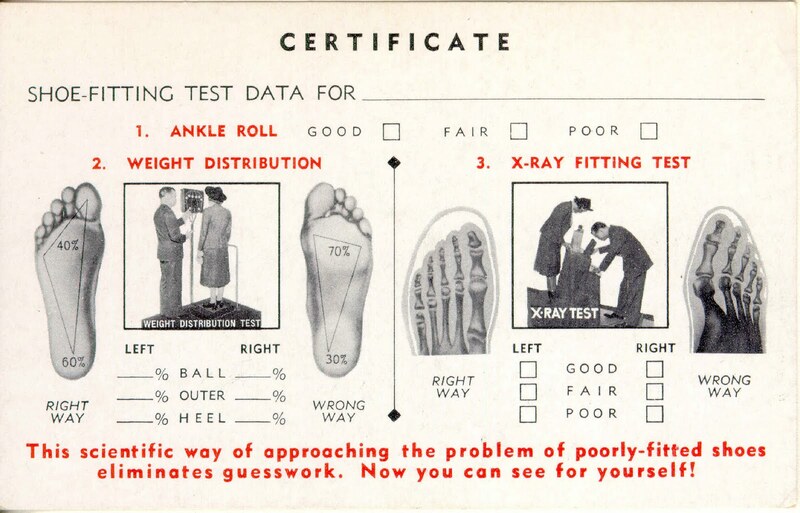 Shoe Fitting was a science those days, as were many aspects of a womans look. 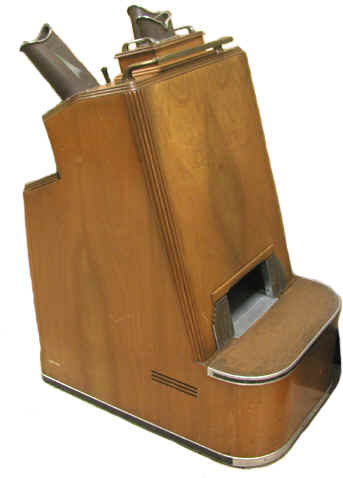 The Fluoroscope for shoe fitting was seen in all shoe stores in the 1940’s. It consisted of a vertical wooden cabinet with a hole into which you placed your feet. When you looked through one of the three viewing ports you would see a fluorescent image of the bones of the feet and the outline of the shoes ! Also found this on Modern Mechanic – which highlights a shoe breaking in service for women. Now that’s service with an ouch ! Let’s finish off with a quick perusal of some mouth watering ladies shoes from our favorite purveyor of truly authentic vintage style shoes Royal Vintage ! Sophisticated round toe pumps with original 1940s heel will show off the curves of your legs. Perfect for the hidden bombshell in you. Made from top quality leather. Well ..these are truly quintessential 1940s style shoes, made from all leather featuring a wingtip style in rich brown and white. They have a high vamp round toe and a genuine 1940s Cuban heel. These beauties go with just about any vintage dress or skirt. With sumptuous styling, adjustable straps and the cutest peep toes, these iconic 1940s shoes named after Dolores del Rio are everything a vintage girl could ask for. No no, don't say "even though i'm a guy" What is that supposed to mean.. Do you realize how many designers are male and i'm positive they all love fashion and see beauty in it or they wouldn't do it. Here is one for you, Are you aware of the clothing line *Victoria's Secret*?, There is no Victoria, it is a company owned and started by a man, haha. I think it is great that you can appreciate beauty, no matter what it is. My brother collects dolls..and loves flowers/plants– Have a great day, and yeah i have seen bits and pieces from the 1920's which i love, right now is the time to go crazy with retro, it is starting to catch on and i think it will be a big and long standing hit. Thanks for all the great research you do for our enjoyment! Ooh, shoes, my favorite topic! I love the fluoroscope – my dad remembers using that in the shoe store when he was young. And you listed all my favorite sources for vintage and repro shoes! Yay!